Seas.. are 3 to 4′ 3 to 4 feet. Winds. are Easterly @ 12 E 8 MPH. Skies.. are SUNNY ALL DAY..
Seas.. are 2 to 3′ 2 to 3 feet. Winds. are Easterly @ 8 SE 4 MPH. Skies.. are SUNNY ALL DAY, with Overnight showers.. Winds. are South-easterly @ 8 SE 4 to 8 MPH. Skies.. are SUNNY ALL DAY. Winds. are Easterly @ 8 ESE 8 to 12 MPH. Skies.. are SUNNY, with occasional rain showers, throughout the day. Seas.. are 2 to 3′ 3 to 4 feet. Winds. are Easterly @ 12 to 16 NE 15 to 18 MPH. 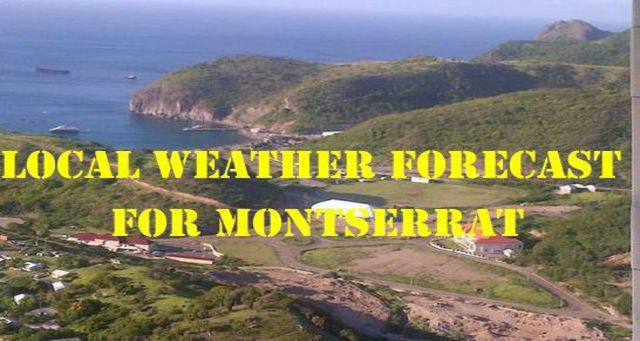 Skies.. are SUNNY, with some early morning showers..
Seas.. are 3 to 4′ NE seas 4 to 5 feet. Winds. are North-easterly @ 12 to 16 NE 12 to 16 MPH. Skies.. are SUNNY, with a chance of early PM. showers..
Seas.. are 4 to 5′ 4 to 5 feet. Winds. are North-easterly @ 15 to 20 E 15 to 20 MPH. Skies.. are Partly SUNNY in the AM. 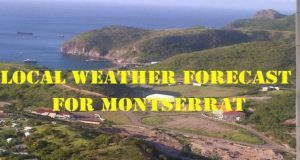 and Cloudy in the PM.Please continue to monitor DMCA ’s facebook page -Montserrat Disaster Management Coordination Agency -DMCA and website – www.dmca.gov.msand ZJB Radio Montserrat for regular updates.